Vessels fitted with cargo cranes will always be described accordingly in charter parties and will, on most occasions be required to load/discharge using this equipment. Any breakdown or substandard operation of the ship's cranes will inevitably result in a claim for off-hire time from the Charterers. This always proves to be very expensive for the Owners and, if regular breakdowns of cargo cranes occur, the vessel's reputation will become tarnished, and may eventually be reflected in the vessel's future earnings. The Master has the overall responsibility for ensuring that the vessel's cargo cranes are being adequately maintained and that he receives regular updates from the Chief Engineer and Chief Officer on their condition. Any defects which affect their operation or efficiency are to be reported to the relevant Management Office immediately, who will decide what course of action is to be taken. In most cases however, repairs and maintenance are to be carried out by the ship's Officers and crew. The Chief Engineer is directly responsible for all crane maintenance and under his supervision and assistance, the Electrical Engineer and other ship's Engineer Officers are to carry out all necessary repairs and maintenance to ensure that the vessel's cranes are always in good working order during the loading and discharging operations with due regard to safety. It is the joint responsibility of the Chief Engineer and the Chief Officer to ensure that all moving parts are adequately greased, machinery being the Chief Engineer's responsibility, and wires, sheaves etc the Chief Officer's responsibility, although they must liase closely to determine a proper and suitable greasing programme, always taking into account the amount of use the cranes have been or will be subjected to. General maintenance of the crane exteriors and fittings is the responsibility of the Chief Officer. In case damages are noted, the stevedores to be immediately notified, a stevedore damage report to be completed and the Fleet Superintendent to be contacted. It may be cases where the Hull and Machinery &Class Surveyor have to be notified. Regular application of good quality wire rope grease will fulfil both purposes. It is the responsibility of the Chief Officer to ensure that sufficient stocks of suitable grease are held on board. Because most wire greasing will be done with the jibs in the stowed position, there are certain parts of each wire which will be less accessible. These are those parts of the hoist and luff wires which lie on a sheave, and those parts which lie inside the crane structure. Attention must be paid to the ends of the wires where they are secured, as this part of the wire is often very inaccessible and overlooked. It is essential that any extra time required, is taken to ensure adequate protection in this area. Provided that the grooves in the sheaves are in good order and that the wire is allowed to run free and not be dragged over coamings, the crane wire should not suffer mechanical damage. The Duty Officer must always be on the lookout for bad practices by crane operators, and stop any abuse of the ship's equipment. The Chief Officer must be informed immediately if such bad practices have been witnessed in order that an appropriate claim can be made. Standard regulations dictate that a wire must be replaced when 10% of the visible strands are broken within a length of nineteen times the diameter. This is a fair guideline and is to be the worst condition into which the wire is allowed to fall, before replacing it. Before arrival at loading/discharging ports, the wires must be checked for broken strands, by sighting along the length of the wire in both directions. It is inexcusable for any vessel to arrive in port and suffer a failure of port/inspection due to a faulty wire. This must be discovered early enough to change the wire in time to commence cargo operations without delay to the vessel, and is the responsibility of the Chief Officer. Time has been lost in the past through vessels arriving in a port where cargo is to be worked, using ship's cranes, and the stevedores have refused to drive them due to dirty windows, untidy and dirty cabs, broken seats and operating levers, faulty ventilation and/or heating, slippery oily accesses and ladders and hand rails in poor or unsafe condition. It is the duty of the Chief Officer to inspect the cranes prior to arrival with respect to the above items, and it is also his responsibility to ensure that any such defects are rectified before the stevedores come on board. During cargo operations it is the responsibility of the Duty Officer to ensure that the cranes remain in good condition throughout the load/discharge and any subsequent defects are brought to the attention of the Chief Officer. The S.W.L. of the cranes must be clearly marked in a conspicuous position on the crane jib, and it must be ascertained by the Chief Officer that all parties concerned with the load/discharge operation are aware of the maximum capacity of cranes, and that this is not exceeded. The weight of grabs, spotters, or other cargo handling equipment attached to the hook must always be taken into account. All crane wires are supplied along with a test certificate which pertains only to that wire. The certificate must be kept on file, and ready for inspection by the appropriate authorities at all times. The certificates must be marked with the position of the wire, i.e. on which crane the wire is situated and its use, e.g. luffing or hoist wire. If the wire is held on board as a spare, the certificate must be marked along with the stowage position of the wire. The wire itself is to be tagged and marked with the applicable certificate number. It is the responsibility of the Chief Officer to ensure that this is done correctly, but the Master must keep the file of certificates in his possession along with the chain register. A certificate must be held on board for every wire on board whether in use or as a spare. If two wires appear on the same certificate, the supplier is to be notified, and asked to supply separate certificates. This is perhaps easier carried out by the Company; therefore, on receipt of a crane wire, which has no separate certificate, the Master must inform the relevant Management Office who will arrange to have separate certificates issued as soon as possible. The Master must ensure that these are always carried out as required by notifying the relevant Management Office well in advance of when such an inspection, test or survey is required to be carried out. The attendance of the appropriate surveyor will then be arranged in a suitable port in ample time. 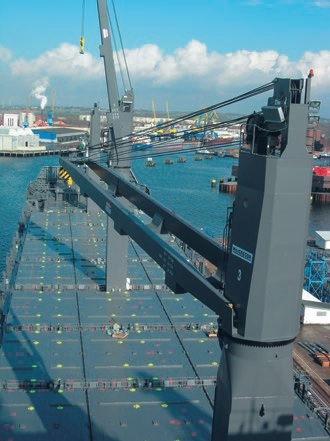 When reviewing survey status on cargo lifting gear, due attention must be paid to the local government regulations of the vessel's destination; many countries require the cranes to have been tested during a certain time limit prior to arrival in their ports. The age of the vessel is often a factor in determining whether the cranes require such extra tests and the agent and or Charterers representative should always be consulted to determine if any special regulations are in existence. An example is the regulations imposed by the Saudi Arabian authorities which require all cranes to be inspected by a class surveyor within the previous six months prior to the vessel's arrival at a Saudi Arabian port, if the vessel is over ten years old. If such an inspection is required, the Master must inform the relevant Management Office in ample time to arrange this. These inspections often require the issuance of a special certificate on behalf of the authorities involved. This must be confirmed beforehand to ensure that the correct paper work is organised in advance. All statutory inspections, tests and surveys of cargo handling equipment must be entered in the chain register and duly stamped and signed by the attending surveyor. These surveys are to include all permanently attached hooks, swivels etc. It is the responsibility of the Chief Officer, under the direct supervision of the Master, to ensure that all the permanently attached equipment is always in accordance with that stated on the test certificates, and they are to be clearly marked as such. A visual examination of the crane cargo gear and its associated structure, wires etc, for signs of fracture, wear, etc. A load test of the gear, usually using static weights. The test weight will be S.W.L. plus 25% for cranes less than 20 metric tonnes S.W.L. For cranes with S.W.L. between 20 and 50 metric tonnes the test weight shall be the S.W.L. plus 5 metric tonnes. Cranes with S.W.L. greater than 50 metric tonnes will be subject to weight test of S.W.L. plus 10%. In some cases the yard will insist on drawing the shafts and examining 25% of the working sheaves. Where a new test number is used, a new certificate bearing the new number is issued. Where the existing marks are used, they must be re-stamped and the numbers verified. On completion of the survey, the Cargo Gear Register must be properly endorsed on the page reserved for quadrennial surveys, and the marks on the relative crane cargo gear matches the certificates. To this end, it is the responsibility of the Chief Officer to ensure that these requirements are met. The Cargo Gear Book is a legal document of similar standing to the official log book or oil record book and must be treated accordingly. It is a declaration on the ship's part that her cargo gear complies with the regulations. The book must always be ready for inspection by surveyors who may wish to inspect it prior to taking the ship's gear into use and the Master shall be responsible for ensuring that this is always the case. In the event of an accidence caused through failure of the ship's gear, it would almost certainly be called in evidence. In addition to the above statutory inspections, tests and surveys, it is the Company's policy that the cargo gear is subject to more frequent inspections by a responsible member of the ship's staff, which, for the purpose of these inspections, is to be the Chief Officer for wires, shackles, hooks, swivels, ponder balls etc, and the Chief Engineer for the lifting machinery and plant. It is of paramount importance that the numbers on all shackles, hooks, chains etc be cleaned up and made legible. Any faults found during such inspections must be rectified and defective parts replaced. The period between these inspections must not exceed six months, and should be more frequent if deemed necessary. The Lloyds Register pocket book “Survey and Examination of Ships’ Lifting Appliances” is supplied to all vessels and this should be consulted by the inspecting officer. The inspecting Officers are to make a report on their findings and pass this to the Master who will keep them on file in his possession as a record of ship's staff crane inspections. The Master is responsible for ensuring that these inspections are carried out to his satisfaction and with the appropriate frequency. It is an International requirement that the location of each piece of equipment used for lifting is indicated on a plan which must be available for inspection by a competent authority at any time. One copy is to be kept on the bulkhead of the ship's office and another working copy is to be maintained. It is the responsibility of the Chief Officer to ensure that these are kept up-to-date and are accurate. The plan must contain details of the location, safe working load and certificate numbers of each crane, grab, wire, hook and swivel on the vessel. Topping up of deck cranes or removal of the jibs from their crutches prior to arrival in port is strictly prohibited. In addition to maintaining the cargo gear to the highest standards, the following items must be specifically checked on each occasion on which the vessel arrives from sea and when cargo is to be discharged or loaded. Limits - The hoisting and luffing limits are to be tested and, if necessary, must be set in strict accordance with the manufacturer’s instructions. Crane Oil Levels - Check the oil levels in all the relevant header tanks, servo tanks, etc. Crane Floodlights - These must be tested, as are the interior lights in the driver's cabin and in the machinery space. Crane Windows - These are to be washed clean and cracked or broken windows must be replaced, and the seals checked. Hinges and locking clamps are also to be checked that they are free. Machinery Spaces - Must be kept clean, tidy and free from oil and water on the deck plates, and the drains must be proven clean and clear. Cooling Fans - These must be tested and proven in good working order. All ventilator flaps/cowlings which require to be open during crane operation, together with associated locking devices are to be free. Ladder ways and Platforms - These must be inspected and kept clear of any oil, grease or water on the foot treads, and the handrails must be intact and safe. Crane and Machinery Space Watertight Doors - Sealing rubbers to be intact and all hinges and closing handles must be oiled and kept free. Chain, Hook and Ponder Ball - This assembly is to be kept painted with a highly visible or fluorescent paint, most commonly dayglow orange, and must be maintained in this condition. Ponder ball swivels are to be maintained free and must be marked with the safe working load of the rig. With continual slight movement taking place between the mating faces of the chain links, it is inevitable that some wear will occur, and these areas are to be periodically checked. Oil Cooling Ducts and Grills - Make sure watertight access doors are open, and all trunking/cooling fins/grills are clear of residual cargo dust and obstructions. Slip Rings - Electrician to megger test prior to operation. Electric Cable Lead Pulleys - Must be checked and maintained free. Failure to maintain these in a free condition will result in the electric cable abrading/chaffing with consequent damage. Before commencement of cargo operations, the electric cable is to be manually pulled to check the free operation of the cable guide pulleys. If the guide pulleys do not move then they may be adjusted too tightly or may be seized, and steps must be taken to ensure free turning. Electric Power Cable/Plug and Socket - Electrician carry out a megger test prior to them being connected. On taking off the watertight covers, any residual water/moisture must be completely dried out. It is mandatory that, on every occasion, and without exception, crane jibs are lowered into the jib crutches and secured before putting to sea. The electric plugs and sockets are to be covered against entry of water, and the electric cable is to be hove sufficiently tight to prevent chaffing when the vessel is working in a seaway. All crane windows, doors and ventilation hatches are to be closed and any portable guardrails and/or chains to be replaced. If your vessel carried grabs or other cargo handling equipment, they shall be well secured on every occasion before the vessel proceeds to sea. Under no circumstances should they be left unsecured, even during short coastwise sea passage. CON09 “Gantry Crane Monthly Hours And Maintenance Report” must be made ship / crane specific and submitted to the management office each month. Where the vessel has conventional cranes, Form DRY 11 should be used. These are very important and have many uses; in particular they will highlight recurring crane faults and problems which may be easily remedied. They also detail running hours, amount of cargo handled by each crane and each crane wire, and are therefore useful in forecasting a failure by comparing the actual amount of usage with the expected life of a particular component, and so prevent down-time by taking preventative action before a failure occurs. No person is to be allowed to operate lifting equipment without adequate training and familiarisation with the operating instructions. No appliance is to be operated in a manner other than described in the operating instructions. Persons who are permitted to operate equipment or assist in the operation of lifting equipment are to be fully conversant with the appropriate sections of the CODE OF SAFE WORKING PRACTICE. Under certain circumstances the use of personnel baskets lifted by the ship’s cranes presents less risk than the use of gangways or pilot ladders for access to the ship. In addition, prior to arrival in any area where the use of baskets is probable, then the crane is to be thoroughly checked both mechanically and operationally by the Chief Engineer and the Chief Officer. This is to be verified by a log entry to the effect that this examination has been carried out. That a risk assessment is carried out and that this method if transfer presents the option with the least risk. That the operating procedure is documented including parameters such as weather etc. That the personnel driving the crane must have received appropriate training and instruction. That where the transfer is over water, lifejackets are worn by all personnel being transferred. That all personnel, including those being transferred, are briefed in the transfer procedure. That in the normal type of basket used, personnel travel on the outside of the basket and luggage on the inside. In many cases, especially onboard container vessels equipped with cargo cranes, shore gantry cranes are used for loading and discharging. In such cases the vessel’s own cargo cranes are not in use and they have to be slewed prior to commencing of cargo operations towards the sea, at right angles to the ship’s axis. After cargo operations, the jibs have to be secured back into the crutches. This operation has to be authorized by the Chief Officer who has to assure that no shore or sea obstructions are in the way of the jibs while they are operated. Sometimes it is necessary to move the jibs while shore or sea obstructions (such as gantry cranes) are in close vicinity of the jibs. But as this will increase the possibility to make contact with them, the responsible foreman (stevedore foreman) has to be consulted to seek verbal confirmation that all non-vessel’s crane drivers are alerted and will not move their cranes towards the vessel’s cargo cranes and jibs. The vessel is not to leave the berth until fully secured for sea even if tugs are alongside and the pilot is onboard waiting to sail.